Great costumes for an infant can be a challenge. You want your baby to be comfortable while the costume is cute and safe. If you're looking to do something homemade or semi-homemade, these ideas might be just what you need to get your creative juices flowing. If your little one will be stuck in a stroller all night, create a costume that incorporates the whole thing. These creative ideas are easy to make with a little know-how, and are sure to be the hit of the block. Designed for the procrastinating parent, this easy-to-make costume takes just an afternoon and is virtually foolproof. You'll need a large, rectangular piece of cardboard that you can fit on the front of your stroller or carrier (to use in the stroller). Attach the cardboard with plastic ties. Baby can wear whatever he wants for this easy, last minute get up. Cut a large hole in the center, leaving several inches of cardboard on the top and bottom and just a couple along the sides. Paint the cardboard frame to look like an iPhone. Wrap the outside edges of the cardboard phone with aluminum foil. 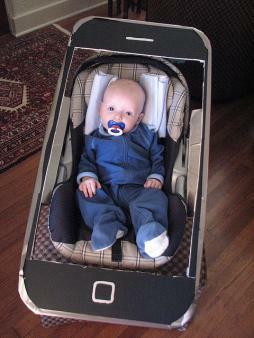 Attach the cardboard to the stroller using plastic ties or fishing line. Voila! You've created what might possible be baby's first selfie. Baby can wear a brown sleep sack or pajamas. Create red and yellow lines using puffy fabric paint (without glitter) to make it look like ketchup and mustard. At the top of the stroller's handles, attach a sign that says 'Hot Dogs $1.00 Each'. If you want to decorate the sides, you can paint large pieces of cardboard striped with red and white poster paint. Baby should wear a white or cream colored onesie with a cap. Outfit the stroller with a red and white checkered tablecloth. You can buy one at the store and cut it to fit the stroller. Using a hot glue gun, affix cream colored yarn in long, dangling sections all over the baby's outfit and stroller. For meatballs, you'll want to use medium sized balls of brown yarn. Using a hot glue gun, affix these on the stroller haphazardly. You'll need irridescent or pearly fabric and cotton batting for bubbles. To make the bubbles, simply take balls of cotton batting, wrap them in the pearl fabric, and secure with a rubber band. You'll want them to be all different sizes. Rubber band side down, hot glue your 'bubbles' to each other. Fashion a ring that fits around the stroller, making sure that it is easy to get on and off, but doesn't fall off so easily that you'll spend your evening losing bubbles. 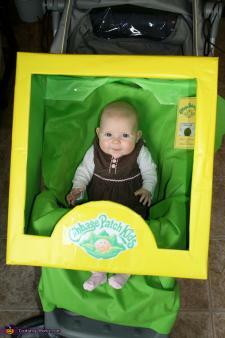 Attach to your stroller various accessories such as a loofah, box of soap, empty shampoo bottle. Give your baby a rubber ducky to play with. Baby can wear a shower cap to complete this cute ensemble! This costume is easy because the baby can wear whatever she wants. . . it's really the stroller you are outfitting. Get a box large enough to fit around and over your entire stroller. Cut out a shape from the front that makes it look like the front of a box a doll would come in. Decorate the box with paint to make it look like a doll box. Options include yellow and green for a Cabbage Patch Kid, Blue and Red for Raggedy Ann (or Andy), or simply paint it pink with words like 'Baby Doll' on the front. Try these great ideas that incorporate mom or dad into the mix if you need something that will work for your baby while you're holding her. Parent needs a chef's outfit. This can be white pants with a white chef's jacket or regular clothes with an apron. Baby can be in a white onesie or white pajamas. Add a chef's hat (if he'll tolerate it) to create a more together ensemble. Put the baby in the stock pot and carry around your 'stew' all night - or at least long enough for the photo op! Mom or Dad needs a face mask. A full headed ski mask might make for a more authentic looking robber, however, opting for a black eye mask might make you seem more familiar to your baby. Baby needs a plain white or cream colored sleep sack. Then with a permanent marker, draw a large dollar sign on the front of the sleep sack. If you don't want to permanently alter your baby's clothes, you can also fashion a dollar sign out of black felt and attach it to the front of the sleep sack with safety pins. This is a great costume if you plan on wearing your baby in a carrier all night. What's great is that you can create the look with things you already have. Mom or dad needs black pants, a white shirt, and a red or black bow tie with a black vest. For the carrier, get a piece of white felt or flannel large enough to wrap around the carrier with the baby in it. You could also use a baby blanket. With red felt, fashion red stripes and the word 'popcorn' for the front of the baby and carrier, where the white felt/flannel will be wrapped. This can be attached to your outfit by safety pins. Dress baby in a white or cream-colored onesie that comes with a matching cap. Hot glue bits of popcorn to the top of baby's hat before putting on the baby, allowing time for the glue to cool. 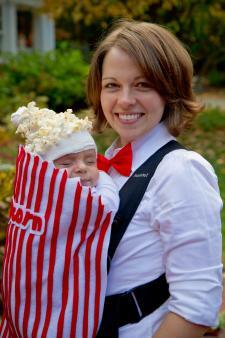 The costume is best suited towards a small infant who wouldn't be able to grab the popcorn off of the hat! This is a simple costume inspired by characters from the Austin Powers movie -and is especially good for a baby who is already sporting the bald look! The parent will need a bald wig cap. You can purchase these at places like Party City. Both baby and parent can get away with gray sweat pants similar to the color worn by Dr. Evil. The look is easy to pull off with your personal Mini Me at your side. On the one hand, this costume requires a little more prep work than other costumes. On the other hand - the effect is a cute costume for a baby that you plan on carrying around in a carrier for your adventures. Mom or Dad needs a black shirt and black sweats or jeans, and glow in the dark stars and stickers. Attach the stickers to your outfit and you have completed your solar system. Attach red, orange, and yellow streamers to the bottom of the carrier to simulate fire as the rocket ship takes off. Baby can wear a white or gray onesie with a night cap. These costumes are ideal because they can be made with little effort and are likely to withstand the rigors of being an infant outfit! Who doesn't love Charlie Brown? Your little one might not know who he is, but everyone else is likely to recognize him in this easy costume. You'll need a yellow onesie and black permanent marker or black fabric paint. With the onesie laying flat, take the black permanent marker and draw a zigzag line across the stomach of the onesie. Outfit baby with his very own stuffed Snoopy, and you have yourself a Charlie Brown who is ready to party. This strawberry is a cute outfit that anyone can make in very little time. You'll need a green cap, and either a long-sleeved sleeper or a full body pajama outfit in either pink or red, along with a black permanent marker. To create the look you'll want to randomly draw small black circles all over the outfit. Have a brand new baby that needs a costume? Try making your own little human burrito. This is ideal for a very young baby who is content to be swaddled. Baby should wear red pajamas with a brown or cream colored cap. The cap should match the swaddling blanket. To create the idea of lettuce sticking out of your burrito, use light-weight, green flannel with two-inch wide fringe cut into it. You can either line the stroller with the 'lettuce' or attach it to the back of your baby's swaddling blanket using hot glue to attach it. Swaddle the baby in a brown or cream colored blanket and tuck in his feet so all together it looks like a burrito with tomato and lettuce sticking out. This costume is easy to make, but will require a bit of prep work. You'll need to find a long sleeve onesie in blue or purple and four pairs of matching tights. You'll also need scraps of white and black felt to make eyes. (Note - if you cannot find a color you think would make a good octopus, consider buying everything in white, and tie-dying it blue to match.) You'll also need cotton batting to stuff the tights with for extra legs. To start, take three pairs of your tights and cut off the tops so you just have legs. Stuff each leg with cotton batting, leaving about one-half inch at the top so you can sew the legs onto the onesie. Once the legs are stuffed, sew them onto the seat of the onesie. Make sure that they are flat, so that it's not bothersome to your baby to sit. Using the white and black felt, applique eyes to the front of the baby's onesie. Your baby will wear the one pair of tights you didn't stuff and the onesie with the other tights sewn on, creating the effect of eight legs! What's great about these is that baby can play with them all night, keeping her occupied. There is something oddly adorable about a baby prisoner. For this outfit, you'll need white tights, a white long-sleeved onesie, or a long-sleeved sleep sack and a black or white nightcap, along with a black permanent marker. Lay the ensemble out on the table so that it's flat. Using a ruler so that you're sure your stripes are even, begin filling in the outfit with black stripes to simulate a prisoner's outfit. You might also want to write a prisoner's number on the right or left breast. If you don't have a black cap, make sure to add stripes to the white one. Dressing up, whether it's for Halloween or some other occasion, is fun for the whole family. 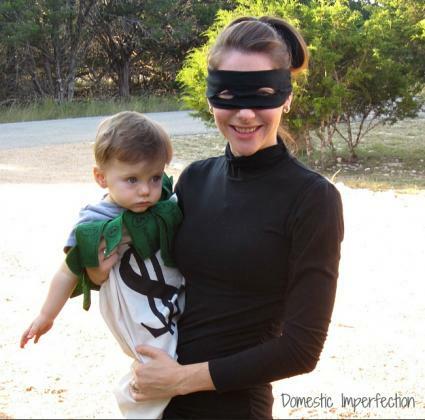 Let baby get in on the act with these super adorable costume ideas.